This program was made at Historic Prairie Village in Madison, SD. The 120-acre site has several blocks of streets like any small town. It’s populated with structures moved here from surrounding small communities and farms. A two-mile railroad encircles the village and farmland. The two annual events held at Prairie Village are well-covered here. Railroad Days is held during the summer. Steam and diesel engines depart from the Wentworth Depot. Former Duluth & Northeastern #29 is an 0-6-0 built by Lima in 1944. It started service in the Army before serving various industries until retirement in 1964. Also seen in service is former US Air Force center-cab #1687, several track speeders, and a reproduction “doodlebug”. We returned to film the Steam Threshing Jamboree, which is held Thursday through Sunday the week before Labor Day weekend. Everything from horse-powered threshers to homemade pumps to giant steam tractors stood row upon row. Demonstrations of steam and gas-powered milling equipment are followed by horse teams patiently powering a thresher. Corn is separated from cob, and wheat from chaff. Hay is baled. Furrows are turned as vintage tractors and their owners compete in plowing contests. During the day, proud farm families parade their vintage equipment. In the evenings, newer machines compete in raucous tractor pulls. 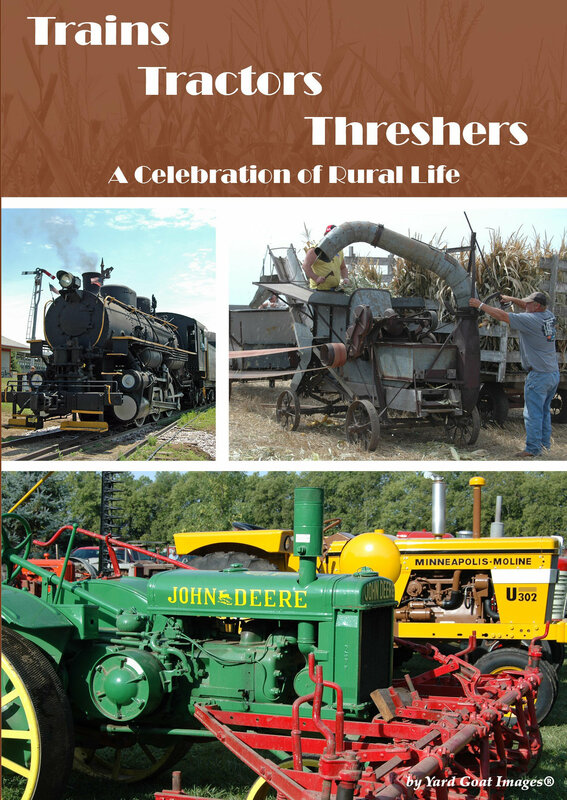 Here are images of the past with the trains of Railroad Days and samples of the color and sounds during the Steam Threshing Jamboree - Order your copy now ! Trains, Tractors & Threshers - A Celebration of Rural Life from Yard Goat Images on Vimeo.